Virginia Diner Peanuts for sale. Buy online at Zingerman's Mail Order. Gourmet Gifts. Food Gifts. If you ever find yourself entertaining the kind of visitors who say things like “America doesn’t have great food like Europe,” just smile and shove a handful of these into their mouths. 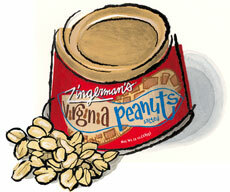 Big, fat, perfectly roasted Virginia peanuts. I’ll go out on a limb and say they’re my favorite nut ever. I'm not usually so black and white in what I love, but these peanuts inspire passion. They're very special. Try some soon. When you’re in Ann Arbor stop by our Roadhouse and try the Doughnut Sundae—it's got loads of these great peanuts. Roasted for us by the folks at Virginia Diner in Wakefield, VA.
"I have been meaning to tell you how awesome the Zingerman's peanuts are. How awesome can a peanut be? That’s what I thought. But, as described on the can, these are the best, biggest peanuts prepared in the best way. They are so freaking good." "The Virginia peanuts have spoiled me for any other roasted peanuts. Their description in the catalogue was spot on. I have not been able to limit myself to just a handful each time, more like several handfuls. The can is almost empty. It has been only 4 days since I opened it."